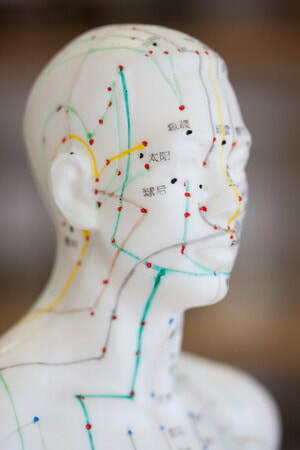 Originating in China thousands of years ago, Acupuncture or “Needle Therapy” helps to relieve the symptoms of many health problems and it also works to uncover the underlying root causes of those symptoms while promoting natural healing or “Qi” of the body. Qi (pronounced “chee“) is the vital energy that flows throughout the body which moves through pathways of the body called meridians and each meridian is connected to specific organs and glands in the body. Qi is a combination of energies mixed together from our food, the air around us, and inherited constitution. Qi provides nourishment to every cell, organ, gland, tissue, and muscle in the body and helps protects us from illness, pain, and disease. Each person’s health is influenced by the quality, quantity, and balance of their Qi. When your Qi becomes obstructed in one part of the body, the flow becomes restricted to other parts. The blockage of flow can be detrimental to a person’s health by cutting off vital nutrients to the body. When the body is healthy, it can bounce back quickly. When there has been a disruption in flow for a long period of time, problems begin to occur. Acupuncture is used to encourage natural healing in the body, improve moods and energy, reduce or alleviate pain and improve functions of an affected area of the body. So how does Acupuncture work? Acupuncture creates a strong stimulation and “reboots” the nerve pathways. The sensation created by the needles ‘jumps’ the neural signal threshold and stimulates the brain to release endorphin's/enkephalins. After a few hours, the signal gets weak again, but with continued treatments the body begins to remember and re-establishes a normal threshold signal to the brain. An Acupuncture session lasts approximately one hour. Your first session may be slightly longer as we review history intake, establish a treatment plan, and determine what areas of the body need to be focused on. Follow-up appointments are not as long. The goal of treatment is to bring the body closer to an optimal state of functioning. By engaging the body’s natural healing response, Acupuncture works to slow or reverse the progression of disease. In some cases, it is possible to prevent disease all together. Acupuncture is a very safe, effective, and drug free way to become a healthier you!